• Explore villages, vineyards, and colorful markets. • Dine at extraordinary restaurants. • Cook alongside local chefs and learn their secrets. • Discover new flavors and friends. Read our testimonials and see for yourself that Delcious Expeditions are trips of a lifetime! Bring your writing back to life while experiencing the world's culinary delights. La Cocina Cooking School and B&B in San Miguel de Allende. One woman's quest for the perfect meal with an extra helping of adventure. When not traveling around the world planning the perfect meal, Kris owns and operates El Buen Café in San Miguel de Allende, Mexico, a restaurant and catering business she’s had since 1991. Her cooking school, La Cocina, as well as her culinary tours have been written up in Bon Appetit, Texas Monthly, Chile Pepper, the Miami Herald, and the Washington Post, to name a few. 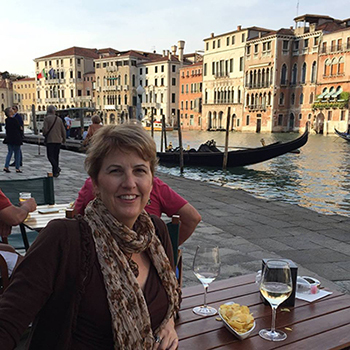 In her spare time, when she's not involved in an employee-related drama or cooing over baby pictures of her beloved baboon Betty, a foster primate in Africa, Kris helps culinary enthusiasts discover some of the most delicious parts of the world. Kris firmly believes in the art of eating well and that not one bite or calorie should be wasted on mediocre fare. She discovered this at an early age while devouring a vat of melted butter with a mini-loaf of homemade bread that her grandmother prepared for her each day. Her parents were horrified at her over-zealous appetite, her grandmother so pleased she melted more butter. And that was just the beginning. Kris’s chosen path has led her to seek and many times find the world’s best food. From pizza slathered in truffle cream in an off-the-beaten-track Tuscan village to the surprising simplicity of a perfect potato in Slovenia, she’ll share her discoveries, as well as her culinary secrets and obscure travel-related knowledge. Kris's literary achievements include three cookbooks: Recipes and Secrets from El Buen Café, Mexican Light, and Savoring San Miguel. You can read a chapter from her we-have-no-idea-when-to-be-released memoir, "She Just Ain't Right," in Hippocampus Literary Magazine. Her newest book, "Voices of San Miguel: An Oral History," is a bilingual collection of memories that tells the story of one of Mexico’s most fabled towns. Learn more here.